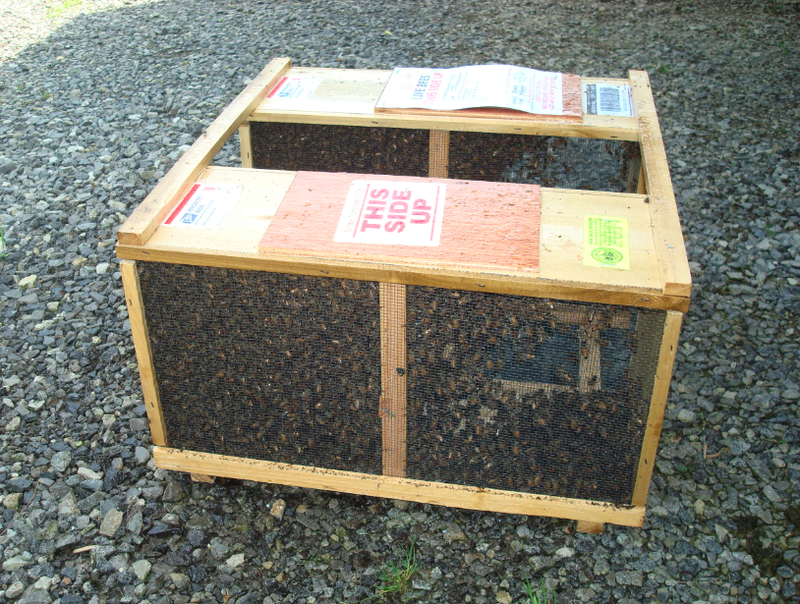 Late season swarming and a long, extremely cold winter resulted in the lost of five of our eight hives. 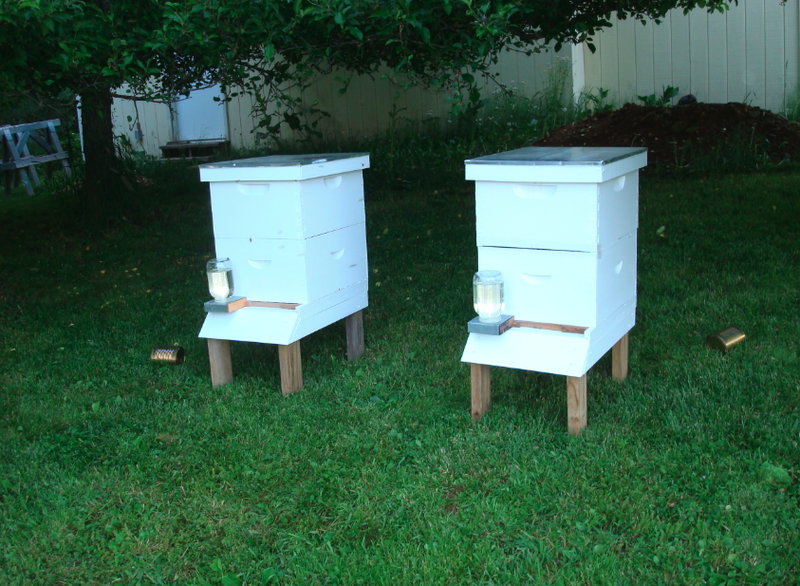 Our two remaining hives have been going strong this winter and just recently swarmed. Unfortunately because of their landing location (very, very high in the trees located in the yard) we were unable to capture the swarms and rehive them; so, instead we watched the ladies and their queen flew away across the neighboring hay field and patted ourselves on the back for repopulating the wild bee population. This year we purchased two orders of packaged bees. One of the most frequently asked questions I get when I tell people that I am a hobby beekeeper is how bees are delivered via mail. I simply order them online (I use Rossman Apiaries) and they are shipped via USPS in mesh wire boxes. We usually get a call from the post office to tell us to meet the truck; apparently our mail lady isn’t a fan of having six pounds of honey bees hanging out in her office. Typically we give the ladies (and a few gentlemen) a day to calm down after their long journey. Late in the afternoon, we lift the wooden top off, pull out the can of sugar water (which kepts the bees feed during the trip), and pull out the wire cage holding the queen. Notice the queen has a white dot on her back. This is option when you ordered the your bees and helps you identify and locate the queen. Colors correspond to years. 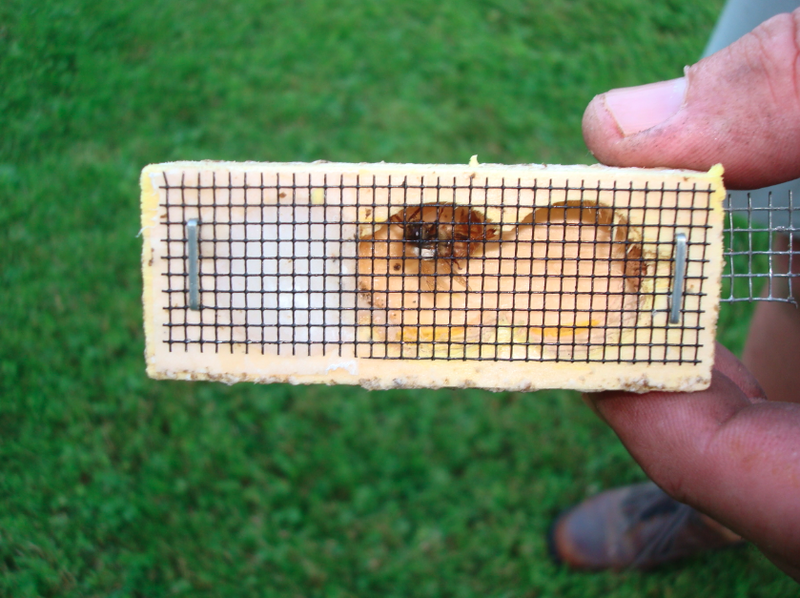 When hiving them bees, the first step is to remove the cork at the end of the queen’s mesh cage. This gives the other honey bees access to the candy stopper (the white material you see in the cage) which the honey bees eat through to free the queen. You then place the caged queen in the new hive. Next, the remaining honey bees are gently shaken into the new hive with the queen. 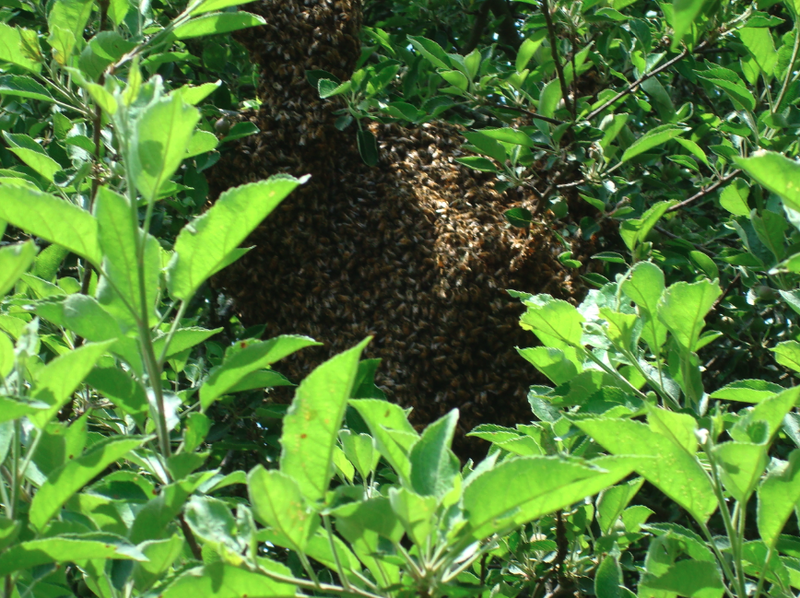 That’s right, you shaken hundreds of bees – with stingers – out of the cage into the hive. My experience is that the bees are very docile at this point since their home is not yet established. In the three years I have kept bees, I don’t think I have ever gotten stung while first installing a new package of bees. The freshly painted hives look awesome under the apples trees. Last summer was a challenge when it came to beekeeping, due to me being seven months pregnant and all; this year I am looking forward to a renewal of enthusiasm for this hobby.